The Bengal is a relatively new companion breed. It was created by crossing a domestic cat with a wild Asian Leopard Cat, with the goal being to transfer the wild cat’s exotic markings to a new, tame domestic breed. The Bengal is considered a large breed of cat and can weigh anywhere from 8 – 15 lbs. Today’s Bengals are long, sleek and muscular cats of medium size. They come in a number of different coat colors and patterns. All Bengals have spots, marbling and/or swirls, and many look remarkably like a tiny wild leopard. Bengal kittens are usually born with a fairly coarse, camouflage-patterned coat, which gradually changes to the adult color and characteristics. It can take up to one year for the mature leopard pattern to develop. It is preferred that Bengals have large spots arranged randomly in a horizontal flow, eventually developing into beautiful, peacock-like rosettes. The coat can be spotted randomly or in horizontal patterns, or it can be marbled, with horizontal stripes arranged randomly on a lighter background. Some Bengals have a coat that is described as “glittered.” The fur shimmers in the light, as if it were tipped with gold dust. Bengals take their name from the Asian leopard cat’s scientific name, Felis bengalensis. 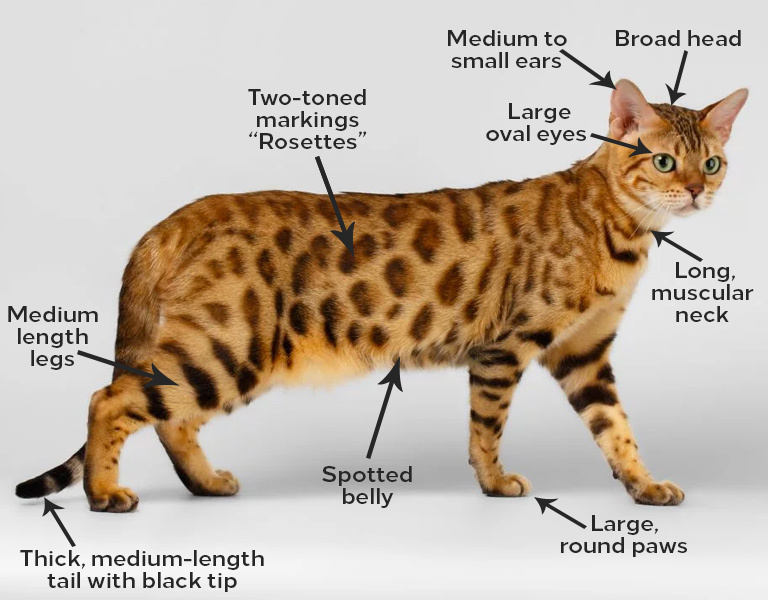 They were created through crosses between an Asian leopard cat — which in the 1950s and into the 1960s could be purchased at pet stores — and domestic shorthairs. Jean Mill, a breeder in California, was the first to make such a cross, but not because she wanted to create a new breed. She had acquired a leopard cat and allowed her to keep company with a black tom cat so she wouldn’t be lonely. To her surprise, since she hadn’t thought the two species would mate, kittens resulted, and Mill kept a spotted female. Breeding her back to her father produced a litter of spotted and solid kittens. At about the same time, Dr. Willard Centerwall was crossing Asian leopard cats with domestic cats at Loyola University. The leopard cats were resistant to the feline leukemia virus, so researchers were interested in finding out if the trait could be passed on to hybrid offspring. Various breeders became interested in developing the cats as a breed. Mill was one of them. Changes in her life had caused her to give up cat breeding, but she was ready to begin again. She had acquired some of Dr. Centerwall’s hybrids and sought out suitable males to breed to them. One was an orange domestic shorthair that she found in India, of all places, and the other was a brown spotted tabby acquired from a shelter. Bengals today are considered to be one and the same with domestic cats, and any Bengal purchased should be at least four generations removed from any ancestors with wild bloodlines. It’s a good idea to keep a Bengal as an indoor-only cat to protect him from diseases spread by other cats, attacks by dogs or coyotes, and the other dangers that face cats who go outdoors, such as being hit by a car. Keeping him indoors also protects local birds and wildlife from this avid hunter. If possible, build your Bengal a large outdoor enclosure where he can jump and climb safely. Bengals who go outdoors also run the risk of being stolen by someone who would like to have such a beautiful cat without paying for it.